Once Upon A Time is located in a historic building. In 1981 Once Upon A Time opened for business at 100 Church Street NE in a building that had once been Vienna's first bakery. Three years later we moved to 120 Church Street and the site of the first store was torn down. The building at 120 Church Street has housed several businesses. At first, it was home to Vienna National Bank, which opened in 1920. In late 1922 the next business in the building was Craig and Wright's Dry Goods Store. This family-run store sold items such as candy, buttons, hardware, hats, utensils and shotguns. It was conveniently located across from the train station. Around 1935 the building was divided into two sections. The larger section was the Cinderella company which was known for its wide selection of children's clothing and accessories. When Once Upon A Time moved into the building the Cinderella sign was still above the door and it stayed there for some time since we consider ourselves somewhat of a Cinderella operation. At the same time, the other portion of the building was the Vienna Beauty Shop. The beauty shop shared the building with three different businesses at three different times. In 1951 the occupant was the Vienna Variety Store. Although they sold a variety of merchandise including greeting cards, the items were not on display. Only offices occupied the first floor and the basement was used for packaging items to be shipped. In 1954 when the Vienna Glass Company first opened it shared the space with Curley's. When Curley's moved down the street in 1960 Vienna Glass took over the entire building and added a garage at the back. Once Upon A Time now occupies the building and has retained much of the charm of the old building while adding new character of its own. As the business has grown it has expanded all the way to the back. The former garage area now features a village of doll houses and a vast array of miniatures, Brio and books. 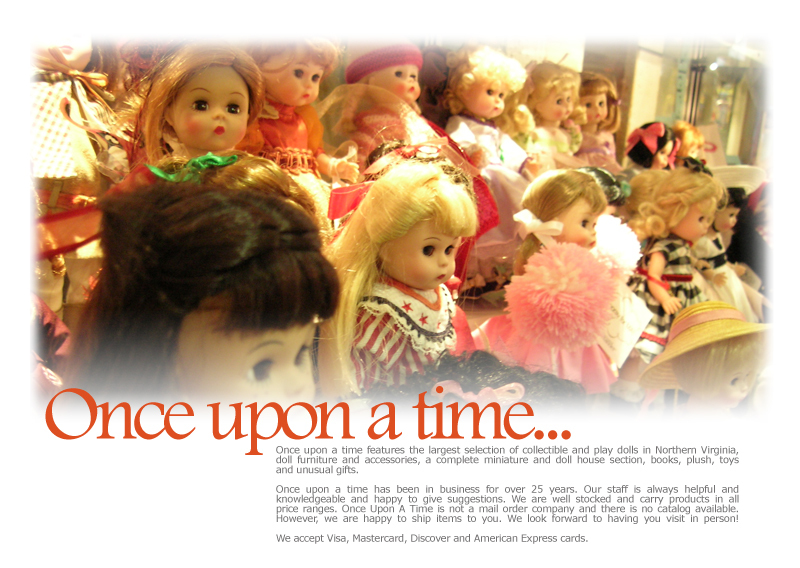 The rest of the store has dolls, accessories, Playmobil, Breyer, Puppets and unusual toys and a historic setting.